The all-new C7-generation Corvette Stingray hits UK showroom this autumn, and packs in 460PS for £61,495 - will this be 2013's hottest supercar slayer? Chevrolet will be pulling out all the stops to ensure this happens, making standard the Z51 performance pack, which includes a number of enhancements for its sub-4.0 seconds to 60mph coupe. The Stingray will be powered by GM's all-new 6.2-litre LT1 V8 engine, which will be the cornerstone of what's left of its muscle car line-up in the future. Transmission will be a seven-speed manual with active rev matching, which blips on downchanges, similar to that first used in the Nissan 370Z. As well as 460PS at 6000rpm, the LS1 develops a whopping 630Nm at 4600rpm, when fitted with the performance exhaust system. Chevrolet has yet to release full performance figures for the Stingray, but says that it's expected to hit 60mph in less than four seconds and deliver improved fuel economy. We'd add that with 460PS, it should have little difficulty topping 180mph. Equipment for the new C7 includes a new tablet-inspired state-of-the-art Chevrolet MyLink connected radio with two 8-inch display screens, USB port, SD card and auxiliary input jacks, as well a centre screen that lowers for device storage. The standard Z51 performance package adds an enhanced aero package for optimised high-speed stability, electronic limited-slip differential, uprated suspension settings, dry-sump lubrication, and larger front (19x8.5-inch) and rear (20x10 inch) wheels and tyres. The C7's combination of bangs for your bucks, jawdropping looks, and comprehensive equipment levels make this a car with few direct rivals on the UK market. Even at this relatively bargain price, the Stingray will be up against some stern opposition. Closest rival is probably the Nissan GT-R Premium addition at £61,250, but don't underestimate the Jaguar F-Type V6S, which comes in at £67,520. Although it's considerably less powerful, it more than makes up for this in smooth sophistication and ride/handling. 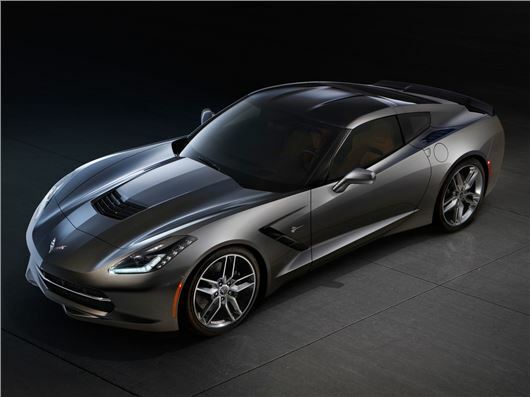 And, of course, right-hand drive, which Chevrolet has no plans to address with the new Stingray. More information nearer the UK launch date. Interesting... In the USA, the Corvette C7 is $55,000 (£36,000) whereas the Nissan GT-R starts at $90,000 (£58,900) and the Jaguar XF with its 470hp 5.0 Supercharged V8 is $68,000 (£44,500). For reference, a BMW 328i (2.0T) is $43,000 (£28,000). The USA does not have a displacement tax or a carbon tax. We do have a Gas Guzzler tax which is based on how much the vehicle exceeds the 21.5 mpg minimum. The Corvette with it's 16/26 MPG rating is taxed at $1300, the Nissan GT-R with16/23 MPG is levied $2600 and the Jaguar XF Supercharged at 15/23 MPG is levied $2600. The Corvette C7 is expected to squeak by the 21.5 combined adjusted MPG (55% city + 45% Hwy) barrier and be tax free.